Enter a unique name for the request variables here. This name will be used for assignment in the WSDL files. The name of a request variable must begin with "rq_" in Intrexx. Otherwise, the variable will not be recognized as a request. This prefix is entered automatically when you enter the name for the request variable. The value that will be defined later as the input for a web service request will be automatically saved to the request variable defined here. 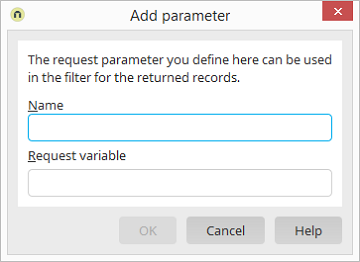 The request variable will, in turn, be used for the return in order to filter the database for the input value. If you search for product numbers, for example, that contain the characters "SW" for software, the value "SW" will be saved to the request variables. The operation type List will then initiate a request for this character string in the original database and will return all data records that contain the characters "SW" in their product number.